We Buy Accident Cars From Insurance Companies. We buy Insurance Salvaged Vehicles. 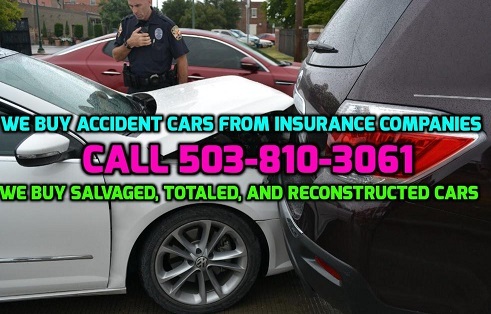 Are you a Claim Adjuster for a Insurance Company looking for a Salvage Car Buyer in Portland or anywhere else in our service area that will buy all of your wrecked and flooded totaled automobiles in bulk? Now you can avoid the hassle of getting rid of junked out totaled cars when you call Fred’s auto removal. We buy insurance salvaged vehicles and even will come and pick it up for you at no cost. Not many other companies can say that, nor say that we buy insurance vehicles for a fair price. You see when you call us at 503-810-3061 you will not be put on hold or talk to those annoying recordings prompting you to push a button so you can have the chance to talk to a customer service rep. Nope, you dial, it rings and a live service rep answers. After that, we quote you a price for your insurance vehicle you want us to buy and then if you agree, we send a truck out, cash in hand to pick up your insurance totaled vehicle. Super painless, super simple! Of course if you would like us to write a check that’s fine too. Fred’s auto removal can proudly exclaim that “we buy insurance vehicles” with confidence and know without a doubt that we are the best in town. Try us out and see. If you are an insurance adjuster and have a junker vehicle that needs to be dealt with, well we buy insurance vehicles so give us a call at 503-810-3061 or and fill out the form on our website. We want to buy insurance vehicles, so help us help you. Contact us today! We buy cars anywhere in Portland, Beaverton, Gresham, and More Cities. What to do when you get a nail in your tire. Getting a nail in your tire can be a great source of frustration but it does not have to ruin your day. As a matter of fact many times if you get a nail in your tire as long as it goes straight in you can actually drive on it for many miles without taking any action at all. There are few things that you should do if you realize you have a nail in your tire. The action that you take will depend on where the nail is and whether or not you are losing air in your tire. If the nail is in the side wall of the tire or between the side wall and the area where the tire comes in contact with the road you will need to likely replace the tire as soon as you can. If the nail is located in the section of the tire that comes in contact with the road, you are much better off because the nail will act as a plug in the tire and prevent from getting a flat tire. As long as your tire is not losing air, drive to the next service station you see and let the service person take care of it. It is usually relatively affordable to have a plug put in the tire and only takes about 20 minutes. If you are losing air then it means you need to act right away. Pull off the road to a safe location. Take your jack out of your vehicle and change the tire, most cars are equipped with a temporary spare. If you are not losing air and you can make it to an auto supply store you can take care of the issue yourself. You will need a pair of pliers to pull the nail out and a plug kit. You can fix the hole while the tire is still on the vehicle. Simply pry out the nail and use the plug kit to plug the hole. Above all else safety is key. Always make sure that you make it to a safe location off the road to inspect the tire and/or change the tire. If you are concerned about the tire going flat and you DO NOT have a spare call for help. In most cases a nail in a tire really is not a big deal, just stay calm and follow the advice above. If you want to sell your car instead of fix the nail in your tire then give Fred’s Auto Removal a call at 503-810-3061 and get a hassle free quote. We Buy Cars in any condition 7 days a week and provide free towing at no charge to you. Did you know we’re on the Radio? Fred's is a sponsor of KISN on 95.1 the Oldies but Goodies Station. Hear our radio ad below.